The concluding international conference of the ARC Laureate Fellowship project was held in March 2018. The brought together an exciting combination of academic researchers, community action practitioners, artists and musicians from around the region. Shuge Wei delivered a 2-hour lecture on the topic of Maoism in China to Year 11 International Baccalaureate History class at Narrabundah College in Canberra on 25 October 2017. This was at the invitation of the College, following positive feedback from the previous Year 11 students whom Shuge had delivered lecture on the same topic. Shuge Wei convened a workshop titled ‘The Post-Truth’ Era? : the Public Sphere in the Asia-Pacific’, hosted by the School of Culture, History and Language at Menzie’s Library on ANU campus, 29 September 2017. The workshop facilitated scholars of various disciplines to discuss how public information has been manipulated in the past and present; share experience in shifting facts from fiction; and to suggest ways of debating an emerging, yet so-far Western-centric, term which frames the times which we are living. Tom Cliff delivered a presentation about the political economy of Xinjiang, at the invitation of the Foreign Correspondent’s Club of China, hosted by Australian Embassy, Beijing, on 21 August 2017. The audience were mainly press and diplomatic corps. Tessa Morris-Suzuki and Uchralt Otede visited a community village together with ANU students during their trip to Outer Mongolia, 3 – 8 July 2017. 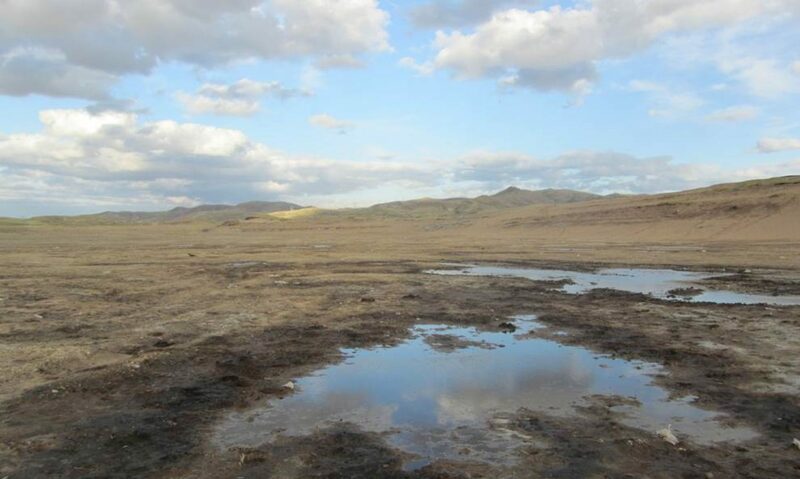 The community is formed by 11 individual families who moved from Ulaanbaatar. Uchralt Otede was invited as a guest lecturer by the Department of General Education, University of Ulsan, in South Korea.Uchralt delivered a talk titled “Asian Communities and Grassroots Movements: A Case Study of Community Science from Inner Mongolia”, in Japanese which was translated in Korean, on 30 May 2017. Shuge Wei’s first book, ‘News Under Fire: China’s Propaganda against Japan in the English-Language Press, 1928-1941‘ (Hong Kong University Press), arising from her dissertation was launched at the Australian National University on 19 May, 2017. About the book: News Under Fire is the first comprehensive study of China’s efforts to establish an effective international propaganda system during the Sino-Japanese crisis. It explores how the weak Nationalist government managed to use its limited resources to compete with Japan in the international press. By retrieving the long neglected history of English-language papers published in the treaty ports, Shuge Wei reveals a multilayered and often chaotic English language media environment in China, and demonstrates its vital importance in defending China’s sovereignty. ‘New Worlds From Below: Informal Life Politics and Grassroots Action in Twenty-first-century Northeast Asia‘, the first publication arising from the Informal Life Politics in East Asia project edited by Tessa Morris-Suzuki and Eun jeong Soh was launched at the Australian National University on 4 May, 2017. About the book: ‘New Worlds From Below’ introduces how ordinary people in East Asia are finding new ways to take control of their own lives, respond to threats to their physical and cultural survival and build better futures amidst a landscape of political disenchantment. Through introduction of the innovative conceptual framework, the book shows how informal life politics in Northeast Asia is generating new ideas and practices that have region-wide and global relevance. Tom Cliff’s first book, Oil and Water arising from his dissertation was launched on July 5, by Martyn Jolly and Stephanie Hemelryk-Donald at ANU School of Art. The two experts compared approaches to using text and image together in presenting a story or argument and discussed the book and photography exhibition. About the book: Oil and Water is the first book-length ethnographic study of Han in Xinjiang, China. By shifting focus to the lived experience of ordinary Han settlers, Oil and Water provides an entirely new perspective on Chinese nation-building in the twenty-first century and demonstrates the vital role that Xinjiang Han in national politics. Uchralt Otede made a presentation at the 7th Living Knowledge Conference, 23 Jun 2016, at Dublin Institute of Technology, organised by the International Science Shop Network of Living Knowledge. The conference was funded by the European Commission as part of the EnRRICH project-Enhancing Responsible Research and Innovation through Curricula in Higher Education (detailed information is available from the conference website in the following: http://www.livingknowledge.org/lk7/). This conference takes a fresh and unorthodox look at the growth and the nature of market exchanges in East Asia. The extraordinarily rapid rise of the capitalist market economy in the region has generated much academic and media debate, but this debate is often based on assumptions about the existence of a single entity called “the market”, and on a presumed dichotomy between “state controlled” and “market” economies. But what is “the market”? Our conference opens up that question by exploring some of the multitude of unorthodox exchange systems – guerrilla markets – which flourish in East Asia as grassroots responses to rapid social transformation. Guerrilla markets span the space between formal and informal markets. They may be complicit in and/or subversive of existing structures of power. Their medium of exchange is not necessarily limited to state-authorised money. They emerge as social groups and communities struggle to survive rapid social change and to create ways of existence that may or may not accord with the aims of state authorities. In guerrilla markets – which include unauthorized trade and mutual aid schemes, knowledge exchanges, cooperatives and complementary currency schemes − economic exchange is inseparably interconnected with social and cultural exchange. Participants in the conference will include not only academic researchers but also those with first-hand experience of involvement in local grassroots action in the region spanning China, Japan, Taiwan, the two Koreas and Mongolia. Their papers will examine unorthodox forms of exchange that flourish within China’s old and new religions, informal mutual aid schemes in China, the spread of local currency schemes and some of their current manifestations in Japan, cooperative agricultural projects in Taiwan and South Korea, the range of intriguing “guerrilla markets” springing up in North Korea and transborder knowledge exchange networks in East Asia. We consider the social and political implications of these developments for the broader region also encompassing Australia, and relate them to trends in the development of unorthodox exchange systems in Australia and worldwide. The symposium forms part of the Australian Research Council Laureate project Informal Life Politics in the Making of Northeast Asia: From Cold War to Post-Cold War. 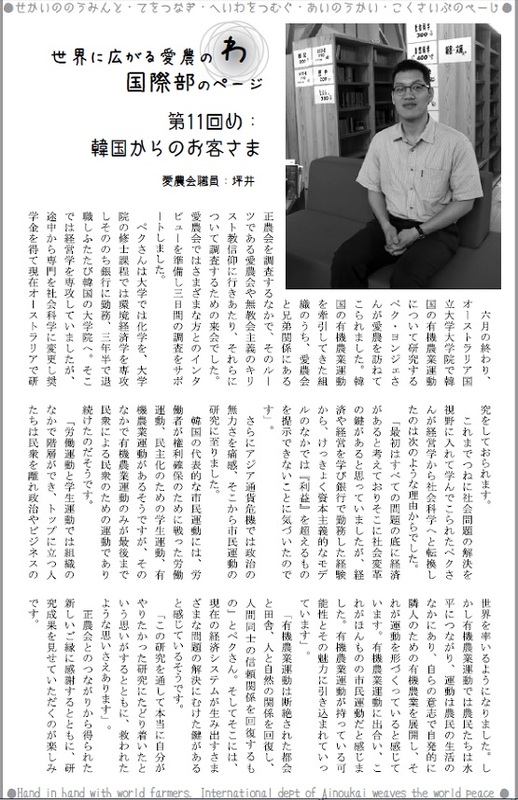 Yonjae Paik’s interview with Ainoukai International Department was featured in Ainoukai’s monthly magazine, issued August 2015. Shuge Wei presented a paper entitled “From Violent Mob to Guardians of Homeland: Anti-Nuclear Movement in Taiwan’s Gongliao County” at the Inter-Asia Cultural Studies Society Conference 2015. The paper examines anti-nuclear experience in the local region. It discusses how the consciousness of the local space was formed and transformed among the villagers, and how the renewed understanding of the locality changed the tactics of the local’s anti-nuclear protests. The IACS 2015 carried the theme “Undercurrents: Unearthing Hidden Social and Discursive Practices.” The theme resonated with our project on informal life politics. The power of “undercurrent,” as the keynote speaker Prof. Abidin Kusno suggested, lay in its invisibility, lack of a set form, being transient and creative. Panel sessions from various academic institutions across Asia discussed a wide range of cultural phenomena and activities in history and the contemporary society. Yet those seemingly “unimportant” cultural activities should not be ignored, since one never knows what they might transform into in the future. Moreover, it was inspiring to see similar political pursuits exist across national borders. The legacy of the World War II, for example, was an important topic for scholars from South Korea and Taiwan. As many of the panel papers suggested, art and creative designs were no longer “decorators” of social movements, serving to attract participants. They have become the main body of the movement itself, transforming the way participants communicate and organize themselves. 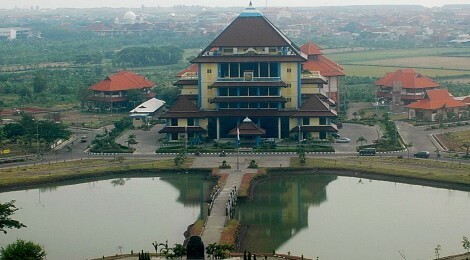 The 2015 Inter-Asian Cultural Studies (IACS) Conference in Surabaya, Indonesia was an important idea-sharing venue for researchers wanting to study and present voices of “undercurrents.” The concept “undercurrents” was defined in terms of hidden social practices and discourses that exist in multitudes and challenge the dominant hegemonic forces. A diverse range of social movement topics from nationwide protests to hidden small-scale cultural and religious practices were presented at the conference. All came together under the overarching theme of presenting voices of the unheard, whose existence in itself challenges the hegemonic paradigm. Scholars enrich and empower the unheard voices by recognizing, identifying and sharing the hidden discourses and practices. On North Korea, numerous scholars uncovered unknown historical figures, hidden cultures and everyday life practices. The papers collectedly demonstrated that North Korea is not a society with a uniform culture; there are multitudes of thoughts, cultures and identities even in a markedly homogenous country like North Korea. Eunjeong Soh presented her paper titled, “The Moral Economy of Everyday North Korea,” which analyses cultural-normative aspects as to how people justify their private economic activities. Two stories of action research presented at the conference were particularly inspiring. The first one was a case of environmental activism initiated by an Indonesian biologist, Prigi Arisandi. 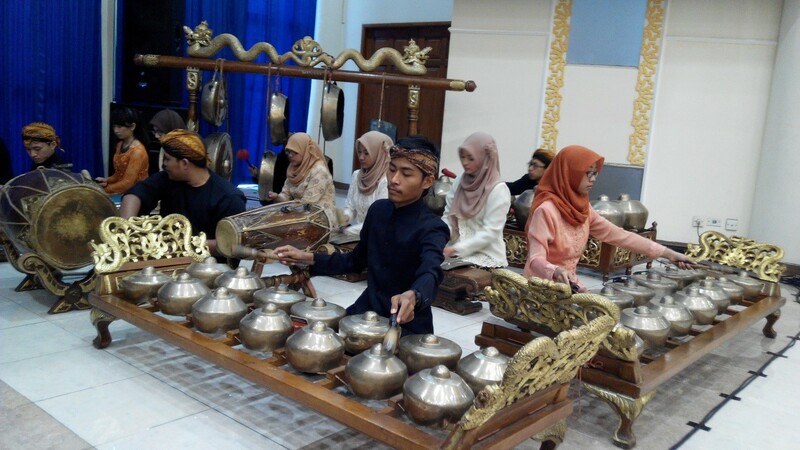 Arisandi emphasized the importance of starting something local and stirring the conscience of the public. His activism involves a participatory process of utilizing his scientific knowledge to empower affected local communities to defend their rights to clean water from polluting agents (businesses). The second case of participatory research was Hong Kong Umbrella Revolution. Numerous academics who participated in the protest movement shared their observation. Their attention was given to students’ creative community-building exercises occurred on the sites of protests. By doing so, these cultural studies scholars offered a fresh insight into social movement today, shifting a focus from contentious dimensions to a community-building process. The community-building process occurred based on hidden cultural resources, which were suddenly uncovered through contagion effects of spontaneous engaging actions of students. Both cases are community-building exercises which convey relevance to our project theme, Informal Life Politics. The conference provided a forum to learn contemporary issues in cultural studies in Asia. One of my main interests at the conference was to learn the various forms of activism that often combines arts and social movements. I was also interested in the discourse of Asianism which suggests the idea of a greater Asian community. In relation to my research, I was particularly keen on finding cases of self-help activism, but unfortunately, there were few sessions which featured such cases that had direct relevance to it. Besides, the discussion on Asianism, particularly the direct intellectual engagement between the former Western empires and the former Asian colonies, was an eye-opening experience to me. Up until then, my view on colonialism had always pertained to the Japanese rather than the West. I came to wonder whether the clash between Asian and Western civilisations stopped at Japan without further spreading to Korea. In the followings, I would like to share two panel sessions that I found particularly interesting. This session was on ‘video activism’ in Japan, an activism to create public space for those who are not visible in urban public space. It included three presentations; ‘Video Hiroba’ in the 1970s, the concept of ‘Absent Citizen’, and ‘an interventional study’ of video activism in Asian cities. First, the ‘Video Hiroba (Hiroba means agora. )’ movement started in 1972 as video recorders came into wide use. Using a ‘do it yourself video kit’ allowed people to easily record the lives of disadvantaged people around their everyday life space whose stories were often not covered in the mainstream media. For example, footages of controversial cases such as demonstrations of Minamata disease victims and the evicted people from Noge District redevelopment project were brought into the public exhibitions by the ‘Video Hiroba’ activists. Hokudo Kobayashi, who presented on the concept of ‘Absent Citizen’ claimed that – “exhibition is also a community”. He further explained that the exhibitions did not only serve as a means of expression but also as a means of communication. Today, this activism still continues to make ‘Absent Citizen’ visible (or present) in urban public space by the efforts put forward by all three presenters of the panel who now conduct an interventional urban study on shantytowns or refugee camps in Asian cities. At this point, I was wondering whether this activism could be a practice of Informal Life Politics in our project. I suggest that the key criteria are the role of the outsider activists and their relationship with the ‘absent citizens’. Informal Life Politics pertains to people’s voluntary and communal self-help activities which does not necessarily require the involvement of outsiders. In that context, I think that close cooperation between the outsider activists and the local people and the local people’s significant role in the activism are particularly important to understand this activism as a practice of Informal Life Politics. Otherwise, I suggest that the video activism will be closer to a form of journalism if the activism was mainly reporting the situations of the marginalised people. During the conference, I was lucky to meet and hear a lecture by Ikegami Yoshihiko, the former editor of Journal Gendai–Shiso. In his presentation, Yoshihiko introduced a book by Pankaj Mishira, From the Ruins of Empire: The Intellectuals Who Remade Asia to show how the Asian Intellectuals in the late 19th and the early 20th century shared the idea of a greater Asia. Focusing on Japanese context, he indicated that there is a paradox in the justification of Japan’s pursuit of imperialism. For Japan in the 19th century, the active acceptance rather than rejection of imperialism was the very way of being emancipated from the Western imperialism. At this point, I became curious about how this contradiction was assessed in Japan’s peace movement – for example, whether Japan’s peace movement could ever have developed if the country had not lost in the war. The discussion on the discourse of Asianism continued throughout the session giving attention to a key figure of Japanese anarchist, Kotoku Shusui and other anti-colonialist thoughts in Asia. The last session was the roundtable on achievements and limitations of the Bandung Conference in 1955. During the roundtable, the participants formed a consensus on the Bandung Conference’s achievement (as one of the most significant attempts to conceive a pan-Asian community) as well as its limitations as an unfulfilled project. The roundtable identified that the greatest obstacle to imagine a greater Asian community is the barriers among the nation states. For me, the challenges that the discourse of Asianism faces comes from the scope of community that it conceives. That is, national boundaries and nationalism within the boundaries cannot be easily replaced by another regional identities. The roundtable gave me plenty of food for thoughts, such as the meaning of being Asian. Since our concept of Informal Life Politics is being proposed in the context of the post-Cold War East Asia, understanding the history of nation-building process in Asian countries must me an important issue that our team should bear in mind. Journal Gendai-Shiso (現代思想) is a monthly journal first published in 1973. It covers philosophy, cultural criticism, sociology science studies, feminism and other social sciences. Please, find the following article for further information. Ikegami Yoshihiko (2001). ‘Gendai-Shiso: Making Use of Postmodernism’, Inter-Asia Cultural Studies, 2(3), pp. 369-371. We are pleased to announce the international conference on ‘Survival Politics in East Asia: Socio-Environmental Crises and Grassroots Responses’, to be held on 4-6 March 2015 at the Australian National University. This is an interdisciplinary, inter-regional conference that focuses on the bottom-up strategies being pursued by grassroots groups and local communities to address socio-environmental crises in various parts of East Asia. For more information, please see ‘Conference and Events‘ on this website. Yonjae Paik was interviewed by the ‘Bal-malk’ (밝맑: ‘bright and clear’) Library, at Hongdong, in Chungnam Province, Korea during his fieldwork in December 2014. His interview script was published in the library’s monthly release subscription, January 2015. It features his visit to the library, becoming a donor member of the library and activities he participated held by the library. Tom Cliff presented a paper titled Lucrative Chaos: inter-ethnic conflict as a function of economic “normalisation” at this European Union-funded CHINET conference. The paper itself is destined for a forthcoming volume on the causes and consequences of inter-ethnic conflict in western China, to be published by Columbia University Press. The CHINET conference was a great opportunity to meet up-and-coming Asian Studies scholars, most of whom hailed from central Europe. The Research School of Asia and the Pacific at the Australian National University provided supplementary funding for Tom’s travel through its Early Career Researchers Travel Grants scheme. Tom Cliff gave two separate book talks in Beijing in September 2013, at Tsinghua University on September 25, and at the People’s University of China on September 26. These ethnographically-focused seminars provided a platform to establish and consolidate connections with academics and students at two of China’s top universities. The Chinese academics provided some useful contextual information for research into informal life politics in China. Tom’s host at Tsinghua University, Professor Jing Jun, spoke about “Friends in Sickness.” Professor Zhao Xudong and Dr Zhang Hui of the People’s University of China spoke about their separate research projects into aspects of state-society relations: emerging practices of mediation in rural China, and the social and psychological effects of relocation on rural Chinese people, respectively. On July 9th, Professor Tessa Morris-Suzuki was announced the Academic Prize laureate for the Fukuoka Prize 2013 in Canberra, Australia. The Prize, is one of the academic world’s most prestigious awards. She was selected for her outstanding achievements in the field of Asian studies and her work on regional cooperation. 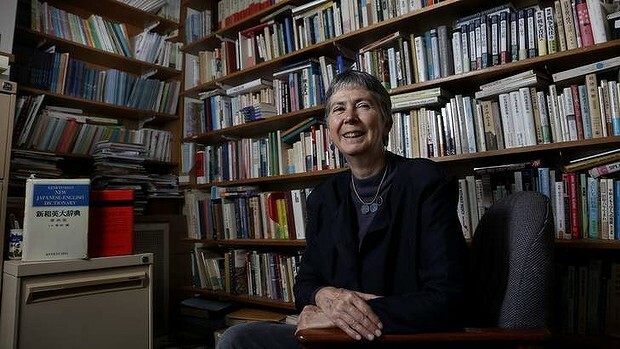 It’s the first time the prize has gone to an Australian woman and only the third time an Australian-based academic has won. Along with the press conference, a notification ceremony was held at the University House Hall of Australian National University. Mr. Masanao Nakazono, the Deputy Mayor of Fukuoka City, presented a Letter of Notification to the newly announced laureate. Following celebratory speeches by Mr. Sam Grunhard, the Executive Director of the Australian Research Council, and H.E. Mr. Yoshitaka Akimoto, the Ambassador of the Embassy of Japan, Prof. Morris-Suzuki gave her acceptance speech. In closing, she referred to a Japanese word minsai which means relations between people, and emphasized the power and possibilities of minsai when international relations is in difficult state.